As soon as you identify a carpet stain it is important that you take fast action. A prompt response will inevitably improve your chances of entire removal of the stain. You will need white, absorbent clothes. You can use white tissue, but you may find it easier to use clothes as they will not shed bits like tissue. Dry cleaning Solution; surgical spirit. Detergent Solution; one teaspoonful of gentle detergent for washing woollens to 0.75 litres (a half pint) of warm water. Detergent and Vinegar Solution; add one tablespoon of white (not malt) vinegar to the Detergent solution. Ammonia Solution; one teaspoonful of branded household ammonia to one cup of warm water. Blot up the surplus spillage. Use the detergent vinegar solution and work from the outer edge of the stain inwards. Use a little at a time, blotting up with dry cloths frequently. See below for our final rinse procedure. Scrape up the excess with a blunt knife. Use a detergent solution starting at the outer edge. Blot dry. Follow up with Ammonia Solution, then blot dry. See below for our final rinse procedure. Scrape up excess with a blunt knife. Use a dry-cleaning solution followed by Detergent and Vinegar Solution and blot dry. See below for our final rinse procedure. This rinse procedure is applicable to all the above methods of stain removal. Simply mix one-part white vinegar and four parts water. Pour mixture into spray bottle and spay over the stained area. Blot dampened area (do not rub) to remove the excess moisture. Spread white kitchen towel (stacked 6-8 sheets deep) over the affected area and a place a weight, such as a book, directly on top. This will help the moisture residue to soak into the towels. Leave overnight and repeat if necessary. Check that your carpet is colour-fast and safe to clean, by testing all solutions in an inconspicuous area before application. 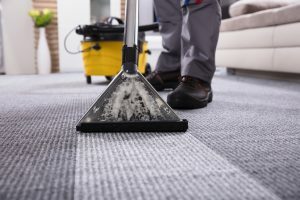 If you need the support of a professional carpet cleaner or have tried other methods of stain removal that haven’t worked, please call our helpful staff today on 0800 695 1118.